Our 2 room apartment was very roomy and comfortable. Good value & very clean & tidy. Great breakfast. Friendly staff. Which hotels are closest to the Cooktown airport? Where to stay near top Cooktown attractions? What kind of hotels are in Cooktown? Which hotel chains are in Cooktown? 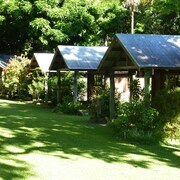 Visitors to Cooktown are sure to enjoy the gardens. Tourists can also enjoy the city's coffeehouses and musical theater. Cultural venues in the city include Eliabeth Guzsely Gallery, James Cook Museum, and Nature's Powerhouse. The city's natural setting is picturesque, including the gardens and these places to visit: Bicentennial Park, Cooktown Botanic Gardens, and Coral Sea. A couple of additional sights to add to your agenda are Cook's Landing Tourist Centre and Cooktown History Centre. 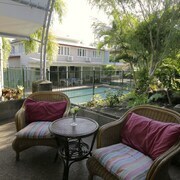 Hillcrest Guest House Cooktown - This 3-star guesthouse features free breakfast, an outdoor pool, and free WiFi. It's a favorite with Expedia travelers for its breakfast and overall value. Cooktown, which sits on the York Peninsula in Far North QLD, is a historic town and a great place for stepping back in time. Stroll through streets lined with heritage buildings and monuments, visit James Cook Museum to learn more about Captain Cook’s first landfall, or come in June for the annual 3-day Cooktown Discovery Festival. While you’re in town, check out Nature’s Powerhouse, which is an environmental centre with a shop, café, and galleries, located within the Botanical Gardens. Meanwhile, the area surrounding Cooktown offers 4WD adventures, taking you to some of the most remote places of Australia. Cooktown has endless opportunities for entertainment, so book your next Queensland holiday today. When it comes to finding affordable lodging for your next trip to the coast, allow us to help. 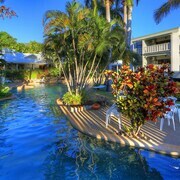 Here at Expedia.com.au, we provide cheap deals on Cooktown accommodation to ensure your travels stay within your budget. Take a look at our selection to find a place that best suits your holiday style today. Cooktown can be reached by air, land, and sea. Cooktown Airport (CTN) offers daily flights to and from Cairns, but many visitors choose to fly into Cairns Airport (CNS) and then hire a car to travel 330 km north on Mulligan Highway, the inland road. Alternatively, you can also drive a 4WD vehicle 460 km on the unsealed coastal road to get from Cairns to Cooktown. Stay within your price range when you book your travel arrangements right here with us. At Expedia.com.au, we’re committed to offering you cheap deals on airfare and accommodation in Cooktown. It only take minutes to book, so reserve today and start the countdown to your holiday on the coast. Are there hotels in cities near Cooktown? Explore Cooktown with Expedia.com.au’s Travel Guides to find the best flights, cars, holiday packages and more!